Today is officially the first day of summer vacation here at our homes. (School ended yesterday!!!! HOORAY!!!) So we are busy planning out both lazy days and adventures for the days ahead. Which reminds me…yesterday I said we’d tell you all about the adventure Elizabeth and I were going on today…but plans have changed…we’ll explain over on Facebook later this afternoon. 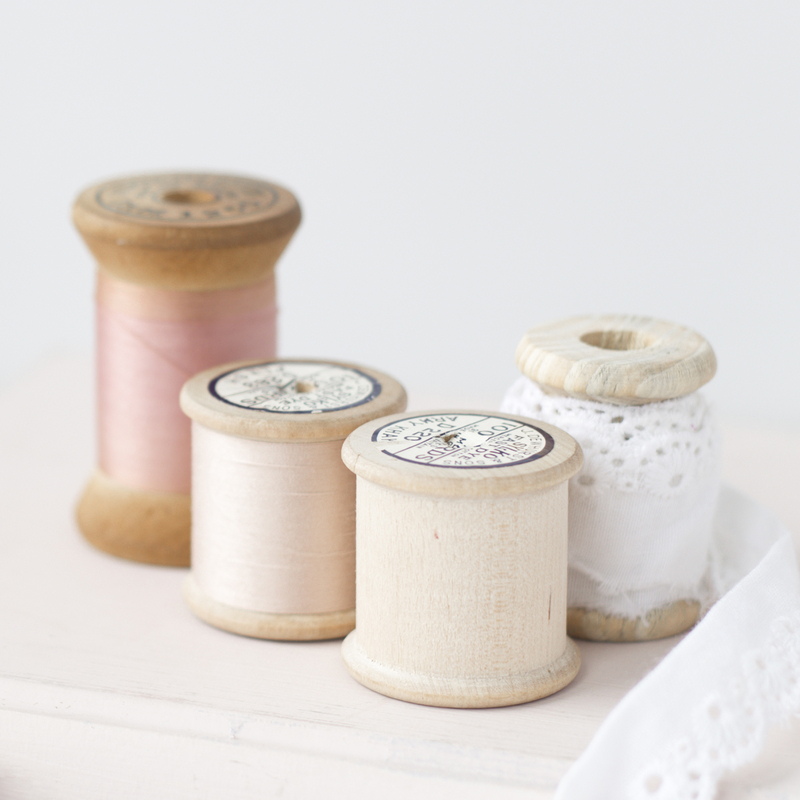 Over at Simple Simon and Company we blog daily about our sewing, crafting, and homemaking adventures. And today we are excited to be here sharing our latest PVC creation for the upcoming summer season. 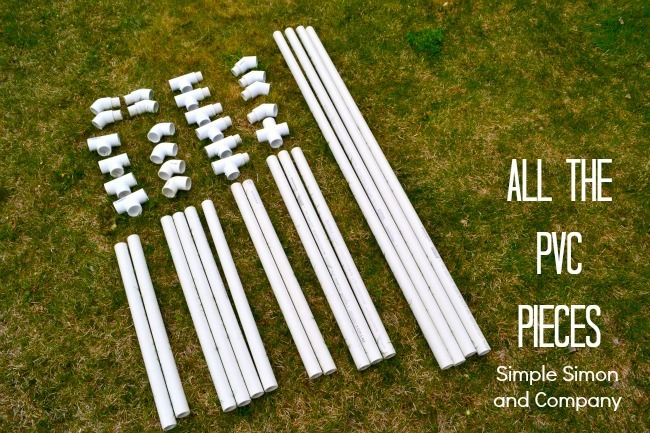 We love to build with PVC pipe. 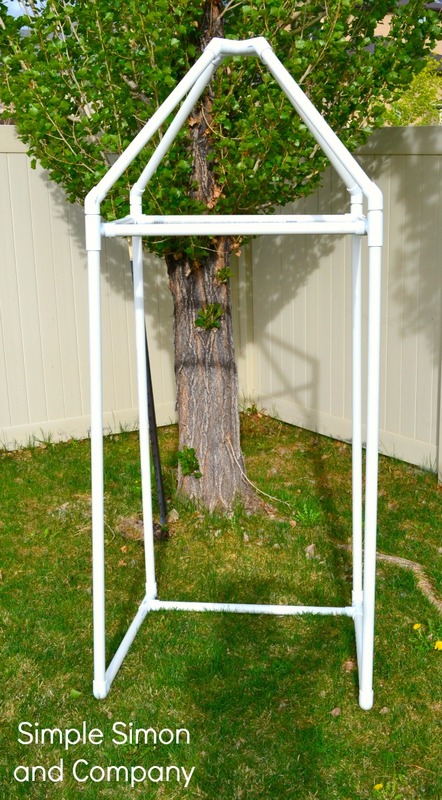 It’s lightweight, easy to put together, easy to store, and…when it comes down to it…it’s just a lot of fun to build with. (It’s like a giant set of Tinker Toys for adults!) 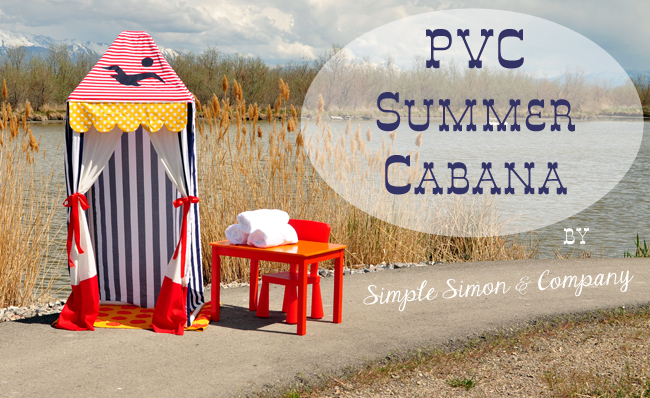 And, this year we wanted to make something to use during our almost daily, non-stop Slip and Slide, running through the sprinklers, water parties…so a PVC cabana seemed like a perfect choice! 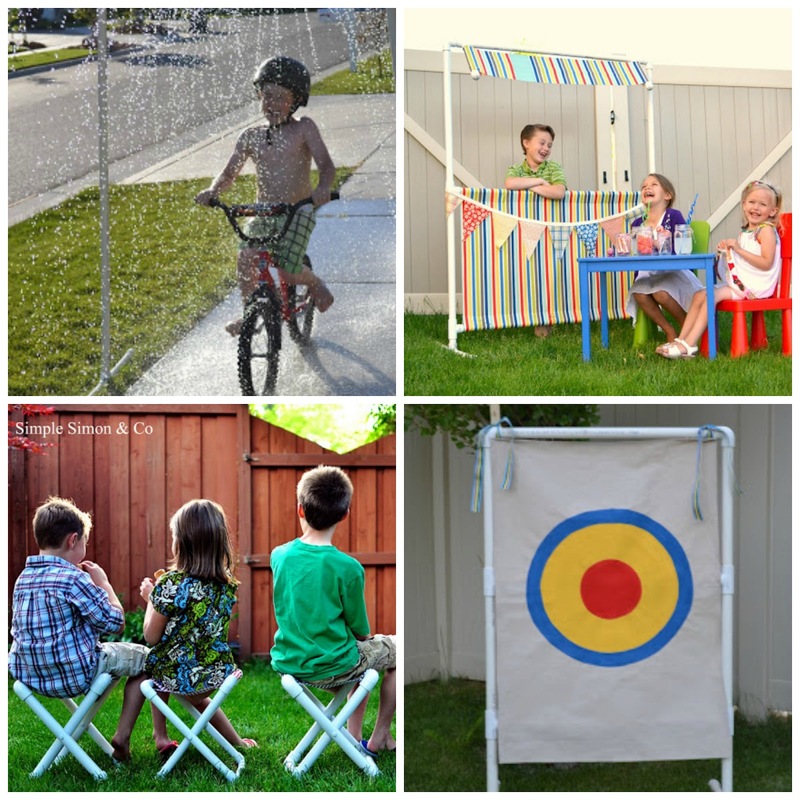 Not only will it give the kids a shady place to cool off with drinks and Popsicles but it also gives them a private place to change in and out of swimsuits (with parental supervision nearby of course!) that doesn’t require running in and out of the house a million times. It’s perfect! The cabana was really easy to construct. It’s simply 4 legs with a roof! As for the covering we simply measured each flat side of the cabana, then took that measurement and added one fourth of an inch to each side for seam allowance. After that we cut each piece out and sewed them together. We used some of Riley Blake Designs fun striped and solid fabrics for the covering and then added a little pop of yellow with a polka dot scallop across the front. And to finish the whole thing off we added a bird to the roof and ribbon ties to the curtains. 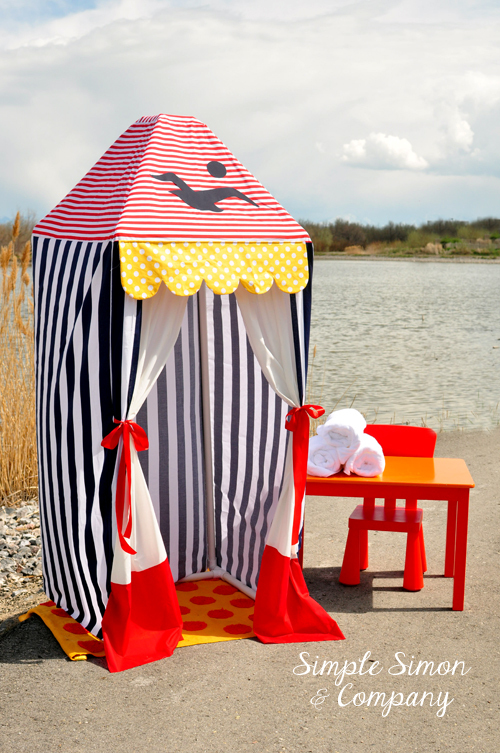 We look forward to this cabana getting lots and lots of use in the summer months ahead. Thank you Jen for having us here today! 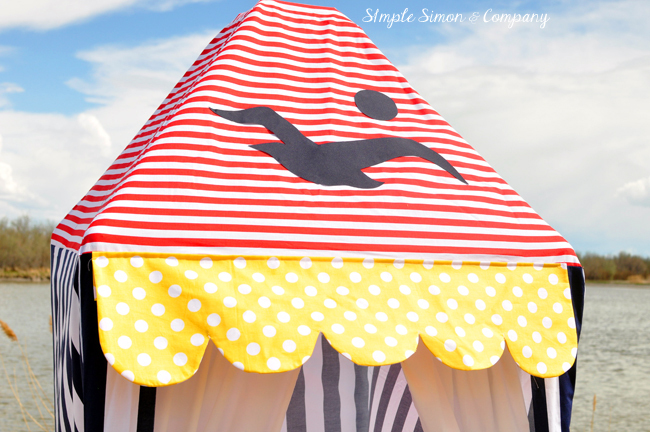 … come visit us over at Simple Simon and Company! Seriously so cute. Love it. Too cute! I’m watching for throwback black bathing suits next. Great work! that’s absolutely great! a really brilliant idea. Hi! I love this and plan on making it myself. How big is this one? (Height and width). Anyone have a cost estimate on this project?